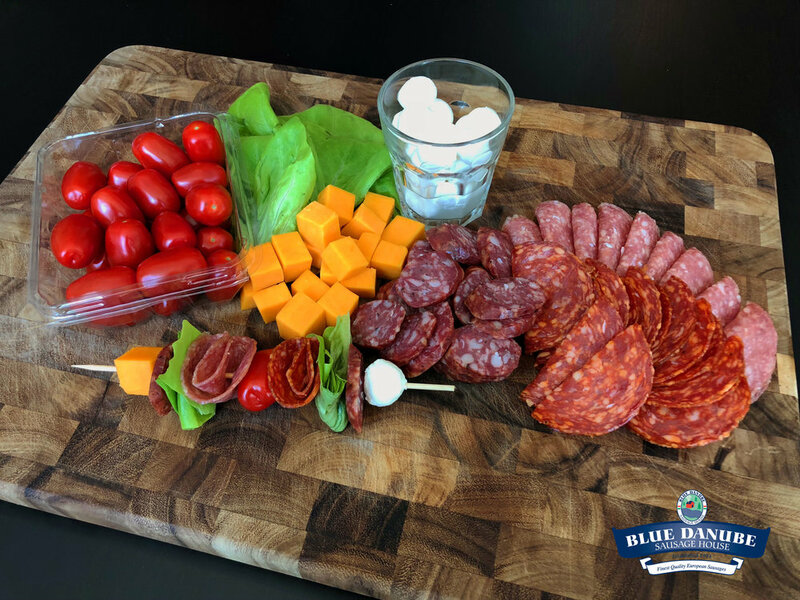 Salami Skewers — Blue Danube Sausage House Ltd.
2. Cut the Blue Danube Gyulai Sausage diagonally into slices. 4. 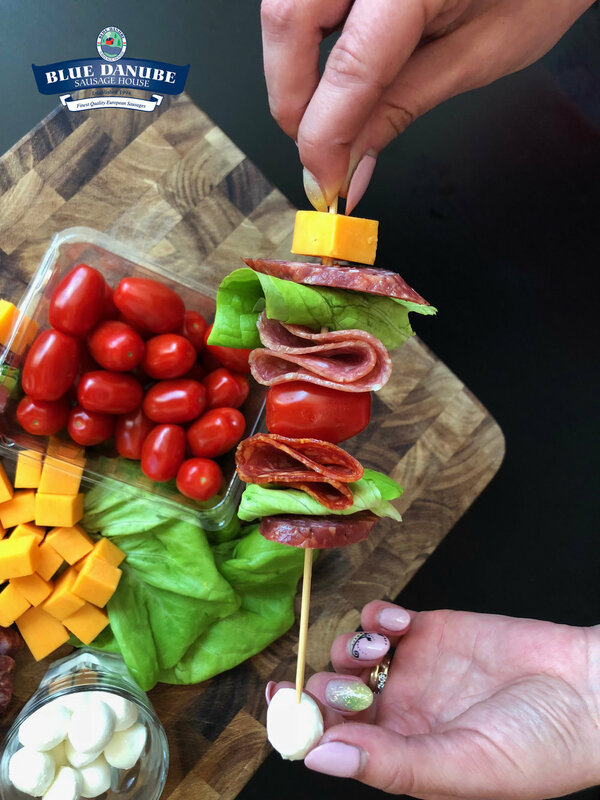 Start with a piece of cheese (bocconcini or Blue Danube Double Smoked Cheddar) and pierce it through the sharp end of the skewer. Push it to the opposite end of the skewer. 5. Next, add a piece of Gyulai Sausage. 6. Grab a piece of lettuce that you have cut up. Fold the lettuce until it is approximately the same surface area as the Gyulai Salami (or a bit bigger). Add the folded-up lettuce onto the skewer, piercing through all layers. 7. Add Pick Salami. Fold slice of salami loosely in half, then fold again in half loosely. Add onto skewer, piercing through all layers. 8. Add a grape tomato to skewer. 9. Add Csabai Salami to skewer. Fold Csabai Salami slice in half loosely, then loosely fold in half again. Add to skewer, piercing through all layers. 10. Add another piece of lettuce, folded up. 11. Add another slice of Gyulai Sausage. 12. Add a piece of cheese (bocconcini or Blue Danube Double Smoked Cheddar). Pro Tip: I like to mix up the cheese variations on the skewers. In my recipe, some skewers had 1 of each type of cheese, while some had the same kind on both ends.